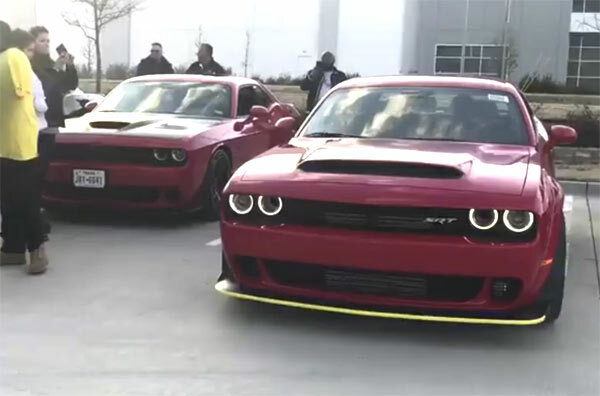 The Dodge Demon was one of the most hotly anticipated muscle cars of recent years and it’s only now that we are getting to see real-life examples hitting the street. The stats. for the car were in super car territory boasting 808 hp from a supercharged 6.2 liter V8 engine, capable of 840 hp with the Demon Crate package, a quarter-mile time of 9.65 seconds at 140 mph, the first production car to be able to wheelie, but only 3,300 being produced, 3,000 going to the United States at a retail price of $86,090. This short video gives you not one but two Demons, up close and personal. The video give you a quick glimpse of the interior and exterior, with its huge hood scoop needed to ram all that there into the engine to produce those huge horsepower ratings. Just check out the video below to see one of the most exciting muscle cars produced in recent years. Related ItemsTwo Dodge Demons Spotted!